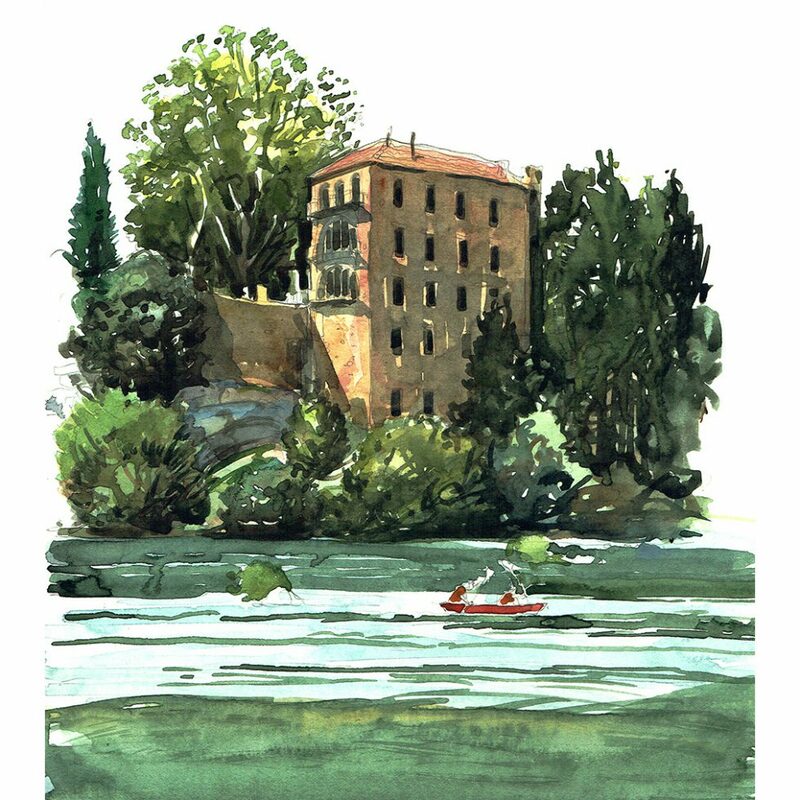 Sign up to my newsletter, and you can enter the free draw to win this original painting worth £130 of The Vieux Moulin Hotel, Pont du Gard in Southern France. This watercolour study of The Vieux Moulin Hotel is 26cm x 17cm, signed and mounted on acid-free card. The newsletter will be sent out on the 26th August 2018. I look forward to your sign up in the box on this page. I give away free paintings, drawings, exhibition tickets and prints with my newsletters. Just to note, you are also automatically entered for all future draws as long as you are still signed up. Once you are signed up, you are automatically entered for all draws as long as you are subscribed. Le Vieux Moulin is an old mill which sits on a bluff high above the Gardon River not too far from the Southern French city of Avignon. The building is no longer a working mill, and has been converted to a hotel and restaurant. A beautiful hotel it is too. The Le Vieux Moulin also possesses incredible views on the ancient Roman aqueduct which crosses the river a few hundred meters away. I initially went to Pont Du Gard to paint the aqueduct, however, as this was more of a holiday than a painting trip, I have to confess I indulged enthusiastically on all the local food and wine so when I lumped down on the banks of the river, I was feeling rather weary. Nevertheless, I got my pad out, and lined up on the wonderful three tier aqueduct. It truly is incredible. I then counted up the arches. 52! ‘Oh lord’ I muttered to myself as I stuffed another piece of Provencal Saucisson in my mouth. I simply couldn’t cope. Not wanting to waste the trip, my eye drifted across the water, and rested upon Le Vieux Moulin Hotel on the opposite bank. I counted five arches. The hotel it is. I wanted to work quickly to capture the angle of the shadows and the whole landscape had a warm, yellow hue. I enjoyed the contrast of the restful view with the cool fast moving river. I was rather pleased with the result in the end. I could say now that I visited the hotel’s restaurant, and sampled the excellent stuffed zuchini flowers. Though I’d be lying. I just finished my Saucisson, then drove back to the house for a siesta. All that said, according to Trip Advisor, the restaurant is excellent.